This outwordly image was taken in the Wakulla Springs cave, in the north of Florida. But it could have been taken in the seas of Jupiter's moon Europa, where NASA plans to send a similar device one day. 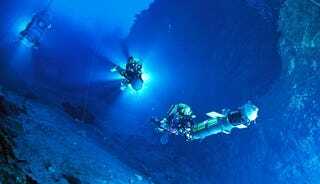 The nuclear-weapon-looking probe—a $720-million underwater three-dimensional mapping system—was tested by Jill Heinerth at a depth of 300 feet during a 10,000-foot lateral movement. 44-yo Heinerth is considered the world's top female cave diver. I just consider her one seriously kickass person.